The Annual Meeting of the Northern Star Quilter’s Guild will be held on Tuesday, May 15, 2018, at 7:00 p.m., at John F. Kennedy Catholic High School, Somers, New York. The Board proposal to amend Article XI, Section 2, of the Bylaws to provide that notice of any future Bylaw Amendments will be communicated to the membership by email and not via the US Mail. Julie Long – VP Communications: Hello fellow quilters: my name is Julie Long and I am running for VP of communications. I can’t believe I have been a member of NSQG for about 30 years!! One of my first friends was Ann Fitzell, while sitting in the cafeteria of the Somers Middle School. I have quilted on and off during that time, raising my family and now I have more time to devote to my own quilting, as well as being a member of Comfort Quilts. Traditional quilting has always been my favorite style, but I also appreciate the time and talent that goes into other styles of quilting. I look forward to serving on the board again in the capacity of VP of Communications. The guild has brought me many great times and memories, and I look forward to giving back. Linda Finegan – VP Education: Linda Finegan has been performing in the Greater New York area for many years. She has played in orchestras all over the world. Highlights of her career have been playing for the Seul Olympics, playing all 33 Verdi operas in Central Park and being a guest artist at the Sarteano Chamber Music Festival in Italy. She played on Broadway in Gypsy, Crazy for You, and Showboat. She premiered Maury Yeston’s Phantom at Westchester Broadway Theatre as well as many other shows there and at the Yorktown Playhouse. She teaches orchestra in the Harrison Central School district. When it comes to quilting, Linda began by attending a class with her mother that a neighbor was giving. They made a Pennsylvania Dutch Hex quilt together as a result of the class. She quilted off and on through the years doing patchwork then appliqué always hand quilting and wanting to branch out but not knowing how. When her last child went off to college, Linda found NSQG and a whole new world of quilting styles and techniques, which have taken her in lots of new directions. Rosemary DePaola – VP Membership: I started quilting in 1997 after the birth of of some of my grandchildren. I have since made quilts for all 20 of them at this point and still need 2 more quilts for the ones born this spring. I joined the Guild in October of 2013 with the guidance of my cousin, Barb Sferra. At that first meeting I met up with friends that I knew from my workplace. It felt like old home week for me and I immediately joined the Guild. I also joined Comfort Quilts which has been an amazing experience for me. I was the Secretary for the Guild for 2 years, 2015 and 2016, and very much enjoyed the inner workings of the Guild. I am looking forward to being your VP of Membership for the next 2 years. Helen May – VP Programs: Having now had the experience of finding guest lecturers and talent to speak at our guild meetings and run workshops, I am pleased to be able to continue for another year. Being retired, I now have the chance to devote time not only to the guild but also to my own quilting. I prefer working in the abstract, creating my own patterns, and learning to longarm. I have really appreciated the wonderful lectures and workshops offered by our guild and have enjoyed expanding our offerings by adding a two day workshop with Maria Shell; of again being able to offer an additional May workshop; and of having the chance to meet some incredible teachers. I hope to continue to be able to offer a diversified rostrum in the next year. Debby Warren – Co VP Quilt Show: Although Debby Warren is a first-year member of the NSQG, she is no stranger to the sewing machine. She started making her own clothes, under the direction of her mother, when she was only 13 years old. About 10 years ago, Deb took up quilting and quickly turned into an addict! Although she’s been quilting for over a decade, she has only managed to keep one of her quilt s for herself, as most of them are gifted to family and friends. Deb is excited to take on this new challenge as Co-Chair of the 2019 Quilt Show for our guild. Daisy Dodge – Co VP Quilt Show: Daisy Dodge has been a member of the NSQG for 4 years now. An artistic mid-western girl at heart, she started drawing, crafting and selling homemade greeting cards to her family at the age of nine. A commercial artist by day, Daisy first got bitten by the quilting bug over 26 years ago, and continues to challenge herself in a multitude of fine arts & crafts.She is super-excited to Co-Chair the 2019 Quilt Show with her long time friend, Deb Warren. Anne Chehebar – Secretary: I started sewing as a young girl, making my own dresses, and worked on my first quilt – an English paper-pieced hexagonal quilt – when I was about 14. When I came to the United States from the UK in 1974, I renewed my interest in quilting, sewing small projects mainly as gifts for family and friends. Julie Long encouraged me to join the Guild and, when I retired, I started attending Comfort Quilts. I have been Secretary of the Guild for the 2017-2018 year. Annette Nash Govan – Treasurer: Annette joined NSQG five years ago. She has served on the board as Special Events Chair and currently as Treasurer. Her interest in quilting include traditional piecing and machine quilting. Annette has served as Treasurer in a number of organizations and is currently Treasurer of her church, Antioch Baptist Church where she leads the Quilting and Sewing Ministry. She has a masters in Finance and bachelors in Economics. Comfort Quilts – Thanks to all who answered the call to make Comfort Quilts for those in need. Your quilts are greatly appreciated. Dulce Esperanza Camp is the only application received by the March deadline. Therefore according to the bylaws, voting by the membership is not necessary. Members whose last names begin with U,V,W,X,Y,Z please bring snacks. This will be a hands-on participation lecture! In this workshop, Sue will teach us how to create unique fabric through different painting techniques. STILL ROOM! We’re counting down the days! The quilts have been dropped off and they are spectacular! Please note: If you have received a voucher to enter the show for free because you have fulfilled volunteer hours, you must have it to enter. The box office is managed by WCSU, not the guild. No voucher = you pay the entrance fee. We are so appreciative of everyone who has worked on the show – it has proven the adage that if you want something done, ask busy women! Remember to turn in your raffle tickets, stock up at the Library bargain book table, buy a special Comfort Quilt kit for your own use, bid on your favorite Silent Auction offering, get a show pin, visit the exhibits, see the demos, hear the lecture, shop at all the vendors, and enjoy all the quilts, quilts, quilts! *Click for Sneak Preview of Silent Auction Quilts! Longarm…May 12 at Kathy Vanacoro’s. Improv…If you were fortunate enough to take Maria Shell’s workshops please bring your pieces. Also bring the quilt you entered in the exhibit and as well as ideas for next year. Landscape…Saturday, May 26th from 1-3pm at the Fabric Mart, Yorktown. EQ…no EQ Sig in May. Paper Piecing…May 9th, 10am-1pm at Fabric Mart, Yorktown. 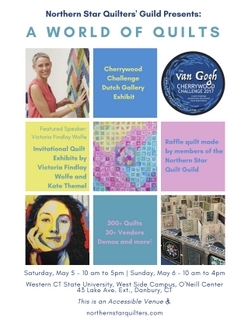 Art Quilters…May 15 at 5:45 in the teacher’s lounge, last meeting for the guild year.